Richard Sosis is an associate professor of anthropology and director of the Evolution, Cognition, and Culture Program at the University of Connecticut. His research interests include the evolution of cooperation, utopian societies, and the behavioural ecology of religion. To explore these issues, he has conducted fieldwork with remote cooperative fishers in the Federated States of Micronesia and with various communities throughout Israel, including Ultra-Orthodox Jews and members of secular and religious kibbutzim. He is co-founder and co-editor of the journal Religion, Brain & Behavior, published by Taylor and Francis. Numerous political analysts have argued that conflicts over sacred land are intractable. These scholars maintain that sacred lands are psychologically perceived as indivisible, or alternatively, in the sociological tradition, their indivisibility is a social fact. Moreover, religious beliefs are viewed as stagnant and resistant to change. Consequently, resolving such conflicts is fraught with difficulty, and even if a truce could be imposed, it would be unstable and violence would eventually erupt. A cognitive and evolutionary account offers a less pessimistic view. Individuals do not conceive of sacred lands in the same way that they conceive of sacred space, such as cemeteries or houses of worship, or sacred objects, such as holy water or prayer beads. Unlike sacred space and objects, whose boundaries are clearly defined, conceptions of sacred land are typically abstract and may bear little resemblance to the contested physical land. While abstract notions of sacred land are indivisible and must remain intact, the physical land is not indivisible, and therefore there is often greater room for negotiation of sacred lands than is generally appreciated. Humans sacralise countless things, including water, wine, cows, dung, trees, books, buildings, and rocks. The types of item that humans sacralise appear unbounded, but possibly the most recurrent thing that humans have sacralised throughout history is land. Some have even claimed that sacralising land is nearly universal among traditional peoples. Despite its prevalence across time and space, there is a notable lack of research addressing why humans sacralise land. The importance and urgency of understanding why humans sacralise land are painfully obvious. Sacred lands are at the heart of numerous recent and current violent conflicts such as Israel−Palestine, Kashmir, Sri Lanka, and bin Laden’s campaign against the United States. Not all lands deemed sacred are involved in conflict, and many territorial disputes, in fact most, do not involve sacred lands. But those conflicts which arise from disputed sacred territories have been particularly devastating and many of them, such as Israel−Palestine and Kashmir, have proven frustratingly difficult to resolve. It has been argued that sacred land and related territorial conflicts, such as ethnicity-based homeland conflicts, are particularly difficult to resolve because lands are viewed by disputants as indivisible. As Goddard describes, “So intractable are conflicts in Jerusalem, Kosovo, Kashmir, and Ulster that their indivisibility appears natural, an inevitable result of clashing identities and attachments to the land.” If contested land is genuinely indivisible, such disputes are expected to escalate toward military conflict more quickly than other disputes and to be more difficult to peacefully resolve. Here I offer a more optimistic assessment of sacred-land conflicts based on evolutionary and cognitive approaches to the study of religion. In a significant paper on the problem of indivisibility, Hassner describes two primary types of policy response to religious conflicts generally, and sacred land conflicts specifically. The first, which we can refer to as the rational actor approach, assumes that political actors are rational and respond predictably to incentives. This approach “seeks to strip conflicts of their symbolic pretences to expose underlying material interests.” It assumes that sacred values can be negotiated like other resources; in other words, sacred land has a price and conflict resolution should concentrate on determining the price of land for disputant parties. The second approach is less optimistic about any form of negotiation and is associated with the work of influential political theorist Samuel Huntington. This “irrational religious actor” approach assumes that political involvement in sacred land disputes is hopeless, since religious forces are mysterious, capricious, and beyond the control of political influence. Here I pursue a third approach, one that recognises religious behaviour as a product of cognitive mechanisms shaped by our evolutionary history. This approach considers sacralising land an evolved strategy that emerges because of the net benefits that accrue to individuals and groups who pursue it, relative to alternative behavioural strategies. While sacralising land is highly visible and contentious in the contemporary world, sacralising land has a long history in the human lineage and is a strategy with deep evolutionary roots in our species. All terrestrial species, including humans, rely on land to furnish the resources necessary for survival and reproduction, and many species of course vigorously defend their territories. Human territorial conflicts, however, differ from non-human ones in important ways. As various authors have noted, the value humans ascribe to land is often unrelated to the value of its material resources, and, notably, wars are fought over lands with little inherent value, including deserts, swamplands, and other barely habitable environments. In these conflicts, 'value' is often measured in intangible currencies, such as identity and sacredness, rather than in material benefits. Only humans sacralise their territories; the goal of evolutionary analyses is to understand the selective pressures that have shaped this unique human strategy. The approach taken here is similar to the irrational actor approach in that it recognises that the behaviour of religious actors often deviates considerably from the predictions of rational choice models. To understand this discrepancy between behaviours and models, we must examine the underlying cognition that motivates behavioural decisions involving sacred things. Psychologists have shown that sacred values can outweigh the economic incentives that are at the heart of rational choice approaches. Atran et al. urge researchers to study the role of sacred values in political conflicts, and scholars who have done so have opened up new avenues for conflict resolution. For example, Ginges et al. have shown how symbolic concessions with little economic value, such as apologies, carry significant weight among conflicting parties. While evolutionary and cognitive approaches to conflict resolution eschew rational choice models, in contrast to the irrational actor approach, they do not maintain that religious actors are beyond the control of political forces. On the contrary, religious actors only appear capricious and mysterious because they are studied with models that fail to consider their genuine emotional attachments to religious and sacred values. There are various analytical strategies that evolutionary scholars have employed to understand political conflict, including ethology, evolutionary psychology, and evolutionary biology. A broad evolutionary analysis of why humans sacralise land, which can address fundamental questions such as the conditions under which such a strategy is adaptive, is beyond the scope of this article. Rather, here I focus on the underlying cognitive foundations of sacralising land. Understanding the cognitive mechanisms that shape our conceptions of sacred land should enhance our ability to offer effective policy recommendations to resolve what are often viewed as intractable conflicts. Before examining the cognitive foundations of sacralising land it is necessary to define “sacred land.” According to Durkheim, “sacred things are things protected and isolated by prohibitions; profane things are those things to which the prohibitions are applied and that must keep at a distance from what is sacred”. For Durkheim, sacredness is a characteristic of something physical, a place or an object. Alternatively, Rappaport defines sacredness as a characteristic of discourse, specifically discourse that is unverifiable and unfalsifiable. Among adherents ‘the sacred’ is unquestionable. The distinction between the object of sacralisation and the discourse that surrounds such an object is important because sacred things are humanly constructed. Humans must do something to make a material item sacred. To the naïve but objective observer, sacred and profane water look the same, feel the same, taste the same, and of course have the same chemical constitution. And even once a ritual act confers sacred status on an item such as water, it is only via discourse that we can express the changed and special status of the object. Thus, here I draw from both Durkheim and Rapapport’s definitions and define sacred as that which is distinguished from profane things and associated with unverifiable and unfalsifiable discourse. Land is physical geographic terrain. Sacred land refers to land which is distinguished from profane land and is associated with unverifiable and unfalsifiable discourse. Sacred land is not just land that is special; in some way the land is connected to supernatural agents – either it is the home of ancestral spirits, given by a supernatural agent, created first by a supernatural agent, or it is a gateway to a supernatural realm – all of which are unverifiable. Also, sacred lands often have counterintuitive and/or counterfactual attributes. For example, many myths recount a glorious past in which the sacred land was home to extraordinary prey or produce, claims which are also generally unverifiable. One intentional consequence of this definition is that sacred land is not limited to the domain of religion, however one might define religion. The environmental movement’s appeal to the sacred status of land is the most obvious example, but others exist as well. For instance, the accounts of the early Israeli kibbutznik farmers all describe the mystical relationship they maintained with the land, despite being passionate rationalists and secularists. And, notably, one of the most common ways to sacralise land, to recall ancient connections to land beyond the verifiable reach of history, is employed by religious and secular groups alike. Toft, for example, describes homelands as an indivisible attribute of group identity and offers various examples of ethnic groups whose ancestral connections to lands are unverifiable, but deeply internalised. It is also worth emphasising that sacredness is not a dichotomous status that can be ascribed to land; sacred lands must be considered along a continuum in which at one end are lands that are highly sacralised, and on the other end are lands that are not sacralised at all. Moreover, because the sacredness of land is always humanly constructed (i.e., it is not inherent in the land), the sanctity of a land must always be defined relative to a particular population. Walter observes that the “most intractable civil wars in the last half of the twentieth century…were those fought over territory.” And there is a widespread assumption among scholars and policy makers, regardless of their approach, that among territorial conflicts those involving sacred lands are the most intractable. Hassner argues that “[c]ontingent processes create competition over sacred space that, combined with the problem of indivisibility, create conflict over sacred space that cannot be resolved by negotiation or compromise.” The intractability of sacred land disputes is invariably characterised as the consequence of two factors: the inflexibility of religion and the indivisibility of sacred land. If one listens to the rhetoric of sacred land conflicts, it is easy to understand why scholars have taken a desperate view of these disputes. Statements such as “Jerusalem shall remain eternally united” and “Can we change God’s will?” do not seem to leave much room for negotiation. Nonetheless, there is considerable room for optimism. Here I argue that sacred lands are not indivisible. I maintain that one reason that sacred lands have been incorrectly perceived by scholars to be indivisible is that they have been conflated with other sacred things, particularly sacred space and sacred objects, which are indeed generally indivisible. A closer examination of how we cognitively understand and behaviourally relate to sacred land reveals that it is more divisible than other sacred things. I support the argument developed here using examples from various sacralised lands, but I rely primarily on my own ethnographic fieldwork and experiences in Israel. Sacred land conflicts are the result of multiple complex factors. The cognitive approach offered here is not a panacea for these challenging conflicts, however, it is hoped that this perspective can open new and productive avenues for negotiation. As mentioned above, one of the primary stumbling blocks in conflict resolution over sacred lands is the characterisation of religion (and religious actors) as inflexible. This is simply incorrect. Often, religious sanctity is conceived by insiders and outsiders to be permanent and eternal. Pioneering scholars of religion, such as Durkheim, repeatedly asserted that “there is something eternal in religion” and modern commentators have made similar claims. In describing the sacralisation of space, Hassner states, “Once a religious presence, a hierophany, has been identified in a place, it grants the place permanent sanctity.” But religions are not eternal and sanctity is not permanent; religions are flexible, malleable, and often respond adaptively to changing environmental conditions, and Hassner is fully aware of this. For example, in other work Hassner (2006) carefully describes how mosques in Iraq were targeted and recklessly destroyed when U.S. troops were inside, suggesting a temporary suspension of their sanctity. Also, during the first Gulf War, despite laws preventing Jews from entering Saudi Arabia because their presence would defile the sacred land, Jewish-American soldiers were reluctantly permitted to enter Saudi Arabia. To replace their Jewish dog tags, Jewish soldiers were given dog tags labelled “Protestant B”. Pragmatism trumped sacred values. And, since 1972, successive Israeli governments have consistently proclaimed Gaza as eternally united with Israel; nonetheless, governance was transferred to the PLO in 1993, and in 2005 Israeli settlements were dismantled and the remaining settlers relocated to Israel. Religion is not inflexible and the sacred status of lands is clearly not eternal. But why does religion appear to be resistant to change? One of the remarkable features of religion is its ability to adapt to local environmental conditions while adherents experience partaking in an eternally consistent and changeless tradition. Rappaport argues that religion achieves this through a hierarchy of religious discourse. He claims there is an inverse relationship between the material specificity of a religious claim and the durability of the claim. Religious ideas are hierarchically organised within communities and at the apex of a community’s conceptual hierarchy is what Rappaport refers to as ultimate sacred postulates, such as the Shahada, Shema, or Vandana Ti-sarana for Muslim, Jewish, and Buddhist communities respectively. These ultimate sacred postulates lack material specificity and are highly resistant to change. However, below ultimate sacred postulates in the religious hierarchy are various cosmological axioms, ritual proscriptions, commandments, directives, social rules and other religious assertions that do experience varying levels of change, depending on their material specificity. The religious norms and practices change all the time but it is understood by those who experience it as an intensification of acceptance. Religions rarely invalidate the old completely; change occurs by adding to previous practices and beliefs and elaborating upon them, while other beliefs and practices slip away unnoticed. Once sacralisation is internalised, it is indeed very difficult to convince adherents that something consecrated is no longer holy. Hence, when undergoing change, religions often retain the most sacralised elements and augment them. Missionaries often retain the dates of pagan celebrations, Jewish prayers appear in the Catholic Mass, and in Micronesia, where I’ve conducted fieldwork, they have held onto their pantheon of gods and ancestral spirits by incorporating them into the Biblical myths that are now prominent in their lives. Two other misconceptions about the inflexibility of religion are worth mentioning. First, religious communities, even fundamentalist communities, are not homogeneous in their beliefs. In interviews I’ve conducted amongst Israeli Ultra-Orthodox Jews, some have confided that they are agnostics or atheists, but they remain in their communities despite their lack of belief because they view the Ultra-Orthodox way of life positively, or at least better than the alternatives. Other researchers have reported similar experiences. Goody has shown that doubt is widespread in world and indigenous religions and he argues that doubt is an inherent part of religious belief. Theologians have made similar claims. Second, outsiders expect religious actors who have articulated and ritually displayed their priorities − typically implying that their religious commitments are their ultimate concern − to behave in ways that directly reflect this ordering of priorities. Religious cognition, however, appears to be strongly encapsulated, preventing most religious actors from pursuing fitness-destroying behaviours. Thus, while many may express extreme commitments to their sacred land, even martyrdom, the actions of most who articulate such views do not match the enthusiasm of their rhetoric. To summarise, viewing religion as inflexible is not only inaccurate, but it impedes productive conflict resolution. Religions are complex adaptive systems that respond effectively to changing socioeconomic and ecological conditions. One of religion’s vital adaptive features is its ability to appear timeless and unchanging to adherents, yet be responsive to varying circumstances. Religions achieve this sleight of hand by retaining core religious elements while readjusting social rules to accommodate new realities. Change for adherents is not experienced as something radically new; it is experienced as increased acceptance of eternal truths that have always been part of their religious tradition. Unless one can support the claim that constructed realities are relatively easy to alter,there is, in short, no good reason to suppose an operational or causal difference between issues that are naturally divisible and those whose indivisibility is the product of human social construction. The analysis I offer here is based on the psychological approach, but I maintain the optimism of the sociological constructivists. While various scholars, such as Hassner and Toft, have asserted that beliefs and perceptions of sacred lands need to be taken seriously, there has been little research investigating the underlying psychology that produces sacred land beliefs. The analysis below aims to initiate this important area of study. Constructed realities are not easy to alter, but I argue that the way in which sacred lands are cognitively understood makes them easier to alter than other sacred items, and consequently easier to divide than formerly appreciated. One of the primary reasons that policy makers and scholars alike have claimed that sacred lands are indivisible is that they have implicitly assumed that sacred lands are like other sacred things, particularly sacred space and objects, many of which are indeed indivisible. To develop this argument more fully, I compare sacred land to sacred space and sacred objects across three dimensions: physical qualities, internalisation mechanisms, and cultural conceptions. This comparative analysis will highlight the unique features of sacred land, many of which suggest that sacred lands are more divisible than previously recognised. The discussion is summarised in Table 1. I have defined ‘sacred’ and ‘sacred land’ above, but it is important to define sacred space and objects as well. Objects are physical things and sacred objects include items such as phylacteries, prayer beads, and holy books, but also tables, forks, instruments, animals and their products, and countless other objects that humans sacralise and treat differently than profane objects. Sacred spaces consist of humanly defined areas in which particular behaviours, typically ritual, are expected. It is a place which “focuses attention on the forms, objects, and actions in it and reveals them as bearers of religious meaning.” Sacred spaces include houses of worship, ritual baths, and cemeteries. There are often many sacred spaces (Via Dolorosa, Temple Mount/Haram al-Sharif, al Aqsa Mosque) within a sacred land (Jerusalem). And sacred spaces also occur within lands that are not sacralised (e.g., the sanctuary of any church in Newark, New Jersey). Sacred space and land are occasionally lumped into one category (intentionally and unintentionally), but, as will become apparent below, there are good reasons to keep them separate. I begin by comparing sacred land, space, and objects along three dimensions of physical quality: construction, permanence, and size. The differences that I highlight are obvious, but I point them out because they all contribute to the distinctiveness of how we cognitively process land. Construction: One of the fundamental characteristics of sacred space is that it is humanly constructed. Temples are erected, shrines are built, and cemeteries are dug. Even when using part of the natural landscape as sacred space, such as turning a cave into a house of worship or using natural springs as a ritual bath, humans rarely leave the site unmodified; humans construct markers and gates to help define an area as sacred and facilitate ritual activities. How sacred objects are constructed varies widely. Most sacred objects, such as chalices, beads, and scrolls, are of course humanly constructed. There may be a few exceptions, such as crystals, but even these objects are often shaped by humans to distinguish them from profane objects. In contrast to sacred space and objects, sacred lands are not humanly constructed. They are of course mentally constructed (see below), but no human construction is required to make or define the land as sacred. Sacred lands are typically designated as sacred by supernatural agents, without human assistance. Supernatural agents primarily act within a religious context, but even in secular contexts agents such as Mother Nature or Gaia can bestow sacredness upon land. Permanence: Sacred spaces can be bulldozed, foreclosed, incinerated, washed away in a flood, and in countless other ways simply destroyed. Demographic changes can also transform sacred spaces. For example, as American Jews left their urban dwellings for the suburbs, their synagogues were converted into restaurants, department stores, and concert venues. Sacred objects of course can also be crushed, burnt, torn, and physically destroyed. Sacred lands, however, cannot be physically destroyed. A fire may raze the land and consequently change the landscape, or a nuclear bomb may eliminate the population, but the sacred land would remain, however altered it may be. The perceived permanence of land is a cognitively odd feature and likely makes land receptive to supernatural conceptions and notions of eternity. Size: Sacred lands are larger than sacred spaces and objects. Even grand sacred spaces, such as the Taj Mahal, are considerably smaller than even the smallest sacred lands. It is rare that sacred lands can be seen by one individual in their entirety at once. With the advent of aviation and space travel, lands no longer seem as immense as they once must have. Nonetheless, the massive size of land, beyond one’s own eyesight, probably elicited a sense of awe that made land historically receptive to supernatural conceptions and associations. Sacred things are not inherently sacred; they must be transformed from mundane to sacred things. Belief that things are sacred must be internalised and culturally shared, and indeed religions employ various internalisation strategies to ensure that adherents cognitively and emotionally distinguish the sacred from the profane. Here I examine four primary mechanisms of internalising the sacred: symbol, myth, discourse, and ritual. I do not explore the dynamics of each of these internalisation strategies, but rather focus on the differences in how these strategies are employed to internalise the sacred status of objects, space, and land. Symbolisation: Symbols are commonly employed when the significata, that which is being signified, is abstract and needs to be physically or cognitively represented. Symbols are effective in reducing the sizes of things which are difficult to observe in their entirety, or impossible to manipulate. Symbols can also connect the present to the past. Physical symbols, such as flags and crosses, can become sacred objects themselves. Land is highly symbolised, either due to its abstract nature, a point we will return to below, or simply because of its size. Land is most commonly symbolised through flags, but iconic symbols such as maps can transform mundane items into charged political objects as well. Otherwise, identical maps alternately labelled Israel or Palestine, depending on the consumer market, appear on T-shirts, key chains, place mats and other items throughout the Middle East. The intensity of symbolisation and the sanctity of the symbolic objects are likely to be associated with the sacredness of the land symbolically represented. Sacred space and sacred objects are not commonly symbolised, or at least less so than sacred land. If one wishes to evoke a connection to phylacteries, there is no need to develop a symbol as the object itself can serve the same purpose. Symbols that are employed to represent sacred spaces tend to be iconic, such as the pictures of the Kaaba or Kotel that adorn the walls of Muslim and Jewish homes respectively. Symbols of sacred space tend to be reserved for the most sacred spaces within a community; the local church is rarely the object of intense symbolisation. The power of symbols is that among the initiated they can evoke potent emotions and this aspect of symbols is vital for internalising the sacredness of land. When living in sacred lands, one is often too mired in the mundane for the land to directly evoke feelings of commitment, thus symbols become powerful tools for internalising commitments to the land. Entering sacred space is usually sufficient to evoke such emotions, thus symbolic representations of sacred space are only needed when access to particular sacred spaces are limited. Myth: The sacredness of things is also internalised through myth. Myths provide reasons and rationalisations for why items are sacred, and a history, even if not entirely factual, connecting sacred items to ancestors. Similarly to symbols, myths help internalise the sacredness of things by evoking emotions, but they additionally tap into our apparent need for narratives. Sacred lands are always surrounded by myth, and in traditional populations myth is often the primary mechanism used to internalise the sanctity of the land. The importance of myth in internalising sacred-land beliefs suggests that sacred lands generally demand justification. Myths invariably assert a population’s priority to the land, through their ancestors, and ‘earliest’ residence is a compelling justification for land ownership across cultures. Interestingly, there is emerging evidence of a cognitive 'first owner bias' in human children and adults; we assume that individuals who first possess an item are the true owners of the item. Others have argued that the well-documented human tendency to place greater value on things one might lose than one might gain, known as the endowment effect, may help to account for the origins of private property, including human territoriality. If a culture asserts that their ancestors originally possessed a territory, psychological biases such as the endowment effect may make such beliefs particularly potent. In addition to ancestral connections to the land, myths often place lands at the centre of the universe, recount how a supernatural agent gave the land to the people, or suggest that it was the first land created, elevating its status. Myths provide unfalsifiable connections to the land. There are countless authoritative myths outside of the Torah, developed by the Rabbis in what is known as Midrashic literature. One popular Midrash claims that Israel is the gateway to heaven. Another Midrash places Israel at the centre of the world: “Just as the navel is found at the centre of human beings, so the land of Israel is found at the centre of the world…” (Midrash Tanchuma, Kedoshim 10). Other Midrashim (pl. of Midrash) describe that the land of Israel possesses extraordinary qualities such as producing enormous produce, including peaches that fill the stomachs of six men. Myth typically connects a people to a land historically, but the Midrashic literature also connects Jews to the land in the future. Midrashim relate that in the time of the Messiah all Jews will return to Israel. These Midrashim are not mere stories – they are genuinely internalised. For example, there are apartments in Israel, owned by American Jews, in which the rental leases stipulate that should the Messiah arrive the renters would have to vacate the apartments because the owners would be moving to Israel. Sacred objects and space also evoke myths, but cross-culturally there appears to be much greater variance in the number of myths related to objects and space than sacred land. It is likely that the intensity of myth development will be a function of how contested an item is. Contested sacred spaces, such as the Temple Mount/Haram al-Sharif, have generated abundant myths as each side aims to give its people a narrative basis for ownership claims. Less contested spaces and objects are likely to develop far fewer myths. Discourse: Sacred things are also sacralised through discourse. There is some sanctified discourse which surrounds very special sacred places and objects, but it is minor compared to that which occurs about sacred lands, which often evoke numerous expressive poems and songs. Contemporary cultures also internalise the holiness of land through sanctified expressions. In Israel, for example, “If I forget thee Jerusalem, let my right hand wither” (Psalm 137) is a well known expression, and it surfaces repeatedly in art and song. Colloquial discourse in Israel also internalises Israelis’ connection to their sacred land. While the Torah and liturgy generally refer to ‘Israel’ as Eretz Yisrael, the land of Israel, in Modern Hebrew ‘Israel’ is simply referred to as HaAretz, the land. Rituals: Rituals are often employed to internalise the sacred status of land. Rituals in indigenous societies not only reinforce the sacred status of land, but they are also used to demarcate territories. In Islam, Hinduism, Christianity and other world religions, pilgrimage rituals connect dispersed communities to sacred lands. In Judaism, worship historically revolved around three pilgrimage holidays – Pesach, Shavuoth, and Sukkot – on which Jews were expected to travel to Jerusalem with their sacrifices to be offered at the Temple. While these holidays are no longer celebrated as pilgrimages, worship and other rituals play a significant role in how Jews interact with the land of Israel. Wherever they are, Jews face Jerusalem during prayer, and Jerusalem and the land of Israel are mentioned more than 100 times in the daily liturgy. And the land of Israel is distinguished from diaspora lands through numerous agricultural laws, such as the harvest sabbatical known as shmittah, that apply only within the land of Israel. Modern Israelis have also instituted or re-established holidays to connect them to the land. For example, Tu B’shevat, the celebration of the trees which was historically a minor holiday primarily observed among small groups of Kabbalists, has witnessed a rebirth in modern Israel in which even secular Israelis customarily plant a tree in honour of the day. And new holidays have been established, such as Yom Yerushaliyim (Jerusalem Day), celebrating the reunification of Jerusalem after the Six Day War in 1967. In 2000, ceremonies and festivities commemorated 3000 years since King David conquered the city. While pilgrimages and memorial ceremonies play a significant role in sacralising many lands, not all sacred lands are pilgrimage sites, and in some sacred lands rituals play only a minimal role in internalising the sacredness of the land. In contrast to this variance, ritual is vital for internalising the sacredness of sacred objects and space. Ritual does not merely identify sacred objects and space; it creates them. Holy water, for example, is not simply water that has been discovered to be holy, or water that has been rationally demonstrated to have special qualities. It is, rather, water that has been transformed through ritual. Ritual is the primary method of internalising the sacred status of sacred objects and space. Ritual is the means through which we interact with sacred objects, and it guides our behaviour in sacred space. Thus, while ritual is sometimes important in reinforcing the sacred status of land, it is always vital in internalising the sacredness of space and objects. The fact that ritual is not the primary internalisation method of sacralising land, as it probably is with sacred space and objects, is fortunate when considering sacred-land conflict resolution. Rituals are simply more difficult to change than symbols, myths, and discourse. It is remarkable how quickly humans will gravitate toward new group symbols, as social psychologists have repeatedly demonstrated. Myths and discourse can also change rapidly. But rituals appear to be religion’s conservative mechanism. Consider the awkwardness experienced when confronting a new ritual. Rituals of course do change, but they are more stable than religion’s other internalisation methods. The final dimension this comparative analysis of sacred land, space, and objects focuses on is cultural conceptions of how individuals and groups construct and perceive sacred things. It is within this last dimension, our cultural conceptions, that we find the most important differences between sacred land, space, and objects for understanding the divisibility of sacred land. Dung litters every corner, the offal of the shops is heaped in the midst of the streets. Filth of every description is accumulated here for years. While the Torah does not explicitly discuss garbage in the Holy Land, the Torah seems to suggest that the land of Israel could be desecrated through the improper behaviour of its inhabitants (Leviticus 19:2). However, the rabbis resisted such an interpretation. They viewed the purity of the land to be impervious to human whim. Indeed, the land was holy despite the profane behaviour of the Canaanites, and although the Israelites are harshly warned that they will be spit out from the land if they stray from the commandments, the land itself will remain sacred. In contrast to sacred objects and space, defiled land does not have to be resacralised. Whereas human conceptions of sacred objects and space require human action to create, maintain, and re-establish sanctity, the sanctity of land appears to come from elsewhere; most typically it is a status conferred by supernatural agents. Danger / Monitor Behaviour: The sacred is often defined as that which is forbidden and dangerous. Accordingly, sacred things must be monitored to ensure appropriate behaviour, and there are consequences for improper behaviour. In many indigenous populations, objects touched by the chief possess a power (mana) and sacredness that can harm others. And sacred space can be equally dangerous. For example, the Talmud (Yoma) describes the increasing risks involved, including death, as one moves closer to the Holy of Holies in the Jerusalem Temple. The kohen gadol (high priest), the only individual permitted to enter the Holy of Holies, is closely monitored to ensure his purity prior to his entrance. Indeed, he is observed and prevented from sleeping on the evening before his entrance for fear of contamination through a nocturnal emission. Unlike sacred space and objects, sacred lands generally do not demand the ritual purity of inhabitants, nor is there intense monitoring of behaviour. Exclusivity: Sacred lands tend to be much less exclusive than sacred space and objects. There are many examples of certain classes of people, within and outside particular religions, that are forbidden to enter certain sacred areas, such as the Jerusalem Temple described above, the sanctuaries of Mormon churches (for non-members of The Church of Latter Day Saints), and women are excluded from men’s houses throughout Micronesia. Many sacred objects, including religious garb, food offerings, and ritual pipes, are similarly taboo for the uninitiated or impure. Sacred lands, however, rarely exclude entire classes of people. It is likely that the necessity of material trade and exchange of knowledge has made the complete exclusion of outside groups on grounds of impurity rare across cultures. Boundaries: One reason that sacred lands are less exclusive than sacred spaces and objects is that their boundaries are more ambiguous. Hassner maintains that sacred spaces have unambiguous boundaries. Indeed, sacred spaces tend to have humanly constructed and defined entrances and exits which demarcate boundaries. The boundaries of sacred objects are also clear (i.e., it is obvious where an object begins and ends). The boundaries of sacred lands, however, are far from certain. The boundaries of Jerusalem, for example, constantly change depending on the political winds,  and what constitute the Biblical borders of Israel are also open to interpretation. Sacred lands that consist of an explicit environmental feature also have ambiguous boundaries. When approaching a sacred mountain or river, at what point is one stepping on holy ground? Unless there is humanly constructed demarcation, essentially turning the land into sacred space, it is difficult to determine. Even the boundaries of sacred islands are unclear since the coastlines change daily with the tides and the coastal waters often maintain elements of holiness. Two anecdotes from my fieldwork in Tzfat, Israel, illustrate this point. First, religious Jews in Tzfat commonly remarked how the air in Israel is holy. Such conceptions of air, however, rarely consider geography. For instance, when I would ask if the air became holy when it crossed the Jordanian border, blank stares of confusion were the typical response. Second, throughout the Second Intifada many interviewees claimed that Tzfat and the neighbouring town of Meron were protected from terrorist attacks because of the many holy people buried in both places. On August 4, 2002, a suicide bomber killed nine passengers on a bus at the Meron junction. When I returned to interviewees who had previously mentioned the towns’ divine protection to ask them about the bombing, they invariably replied that the bombing was not within the historical (and thus protected) borders of Meron. In other words, interviewees did not eschew their belief in divine protection; rather, they simply altered the borders of Meron to fit the new reality. The mind experiences deep repugnance about the mingling, even simple contact, between the corresponding things, because the notion of the sacred is always and everywhere separate from the notion of the profane… The sacred thing is, par excellence, that which the profane must not and cannot touch with impunity. All spittle found in Jerusalem is pure (Mishnah Shekalim 8:1). No fly was ever seen in the slaughterhouse [in Jerusalem] (Mishnah Avot 5:5). One who lives in the land of Israel leads a sinless life (Ketubot 110b-111a). Even the gossip of those who live in the land of Israel is Torah (Midrash Rabbah 34). These rabbinical claims attest to the tension between separating the sacred and profane within sacred lands. If people reside in sacred lands, mundane and profane activities within the lands are inevitable; the physical mixing of the sacred and profane makes sacred lands notably different from sacred objects and space. Such contact with the profane would render sacred objects and space defiled. Sacred land, however, retains its sanctity because the sacred conception of the land is cognitively separated from the mundane conception of the lived-upon physical land. We now examine the cognitive separation of these conceptions more closely. Jerusalem: it is not one, but many. It is a place in which people actually live; it is a place that lives in them. It is a figment of the imagination, an idea. It is visible, open to discovery; it is unseen, hidden to all but insiders. It is constructed of mortar and stone and inhabited by flesh and bone; it is formed of spirit and faith and filled by belief and memory. This is an extreme representation of the sacred/mundane distinction, but it is useful. I am not denying that sacred land is real, I am simply pointing out that those who sacralise land hold two conceptions of sacred land in their heads – one is indeed real, the other is an idealised abstraction. Jews are unlikely to ever proclaim “Next year in West Jerusalem” because when considering Jerusalem in a religious context they are accessing their sacred abstract conception of Jerusalem, which is indeed indivisible. The physical Jerusalem, however, is already divided with separate elections and constrained social and economic interactions between the two halves of the city. The distinction between the abstract conception of sacred land and the physical land itself is critical, because to resolve sacred land conflicts it will be prudent to keep the abstract sacred land concept intact, even if the real land is divided. The underlying theme of all the above comparisons is that sacred land conflicts are not intractable because sacred lands are not indivisible. The physical characteristics of sacred land – that it is not humanly constructed, maintains a sense of permanence, and is incomparable in size – make sacred land receptive to abstract, symbolic, and supernatural associations. These characteristics contribute to the dual perception of sacred land that humans maintain: one of a physical territory, the other of a sacred and symbolic land with supernatural associations. Moreover, the internalisation mechanisms employed to sacralise land – symbolisation, myth, and discourse – are more amenable to change than ritual, which is indeed challenging to change. Rituals often do play a role in the sacralisation of land, but rituals are a much more important internalisation mechanism for sacred objects and space. Most importantly, cultural constructions of land suggest that, unlike sacred space and objects, sacred land is divisible. Its immunity to desecration, the absence of ritual danger and behavioural monitoring, lack of out-group exclusivity, its ambiguous boundaries, tolerance of mundane activities, and dual conceptions – one idealised and one real – all suggest that land is not indivisible. As Eliade observes, there is an irony inherent in sacralising things: anything that manifests the sacred becomes something else, while at the same time remaining itself. This irony suggests that we cognitively encapsulate sacred things and keep them separate from the mundane. It obviously takes a fairly complex psychology to cognitively juggle this paradox, but we seem to do it effortlessly. When holding sacralised wine, one fully understands that if the wine is dropped the glass will shatter, the wine will stain, and the mess will need to be cleaned up. It may be sacralised wine, but it still maintains all of the typical features of mundane wine. This encapsulation of sacredness is also why nobody is existentially troubled when they copulate, defecate, or engage in various other ‘profane’ activities within a sacred land. Indeed, it is likely that selection favoured an encapsulation of religious cognition to prevent it from encouraging behaviours that could have negative fitness consequences. In the above analysis I have largely relied on the Jewish relationship to the land of Israel as a case study, but future work must explore whether the ethnographic data from other sacred lands support the arguments developed here. Subsequent analyses would benefit from comparisons between the internalisation methods of modern religions and indigenous religions. For example, indigenous populations tend to maintain a connection to their lands via their ancestors, ancestors with whom they are in regular communication. Contemporary world religions also assert that their ancestors once roamed their territory, but they are generally not a source of direct worship; they are more likely to be a source of inspiration rather than veneration. Moreover, world religions undoubtedly rely more on theological argument and justification for the sustained holiness of their land than indigenous populations. The doctrinal mode of world religions is also more dependent on repetitive ritual than the imagistic mode of religion that characterises indigenous populations. Reciting the name of a sacred land over 100 times a day, as observant Jews do, is unheard of in traditional populations. World religions symbolise their sacred lands to a much greater extent than indigenous religions do, presumably to rally diaspora populations that do not reside within the sacred territory. Finally, there is less orthodoxy in indigenous populations, which may make it easier to settle territorial disputes among traditional populations. These differences between indigenous and world religions suggest that sacralising land in the modern context may have stronger mechanisms of internalisation than in the past. Sacralising land may be an old strategy, but it may be a particularly potent one in its modern manifestation. While I have focused on the cognitive perceptions of sacred land, this approach needs to be complemented by sociological and economic perspectives for a more comprehensive understanding of land sacralisation. Future work must also explore the determinants of land sacralisation and its association with warfare. Why are lands sacralised in some disputes but not in others? What conditions favour land sacralisation? We also have little understanding of the social process of land sacralisation. How does the initial impetus for land sacralisation arise – is it a result of grass-roots movements or the manipulations of elites? And most importantly, we need more detailed studies on the ways in which external constituencies can encourage religious change that would open avenues for productive conflict resolution. As captured in his famous quote which opened this paper, philosopher Alfred Korzybski convincingly argued that an abstraction derived from something is not the thing itself. Indeed, the abstract conception of land that emerges when it is sacralised is not the land itself. That abstract conception is sacred and indeed indivisible. However, that should not be confused with the land itself. The analysis presented here does not claim that attachments to the physical land are not real; they are. However, the notion that particular lands are indivisible because they are sacred needs to be reconsidered. Sacred lands are both a physical reality and an idealised abstraction; successful negotiations will divide the physical reality, but they will need to respect religious commitments and keep sacred abstractions of the lands intact. I thank Joseph Bulbulia, Dan Finkel, Dominic Johnson, Jordan Kiper, Erika Philips, Ben Purzycki, Paul Swartwout, and two anonymous reviewers for helpful comments on earlier drafts of this manuscript and/or useful discussions, and the Templeton Foundation for generous funding of this research. Alcorta, C. & Sosis, R. (2005).Ritual, emotion, and sacred symbols: The evolution of religion as an adaptive complex. Human Nature, 16, pp. 323−359. Atran, S. (2003). Genesis of suicide terrorism. Science, 299, pp. 1534−1539. Atran, S. (2010). Talking to the enemy: Faith, brotherhood, and the (un)making of terrorists. New York: Harper Collins Press. Atran, S., Axelrod, R., & Davis, R. (2007). Sacred barriers to conflict resolution. Science, 317, pp. 1039−1040. Berman, P. (2010). The flight of the intellectuals. New York: Melville House Publishing. Blake, P. R. & Harris, P L. (2009). Children’s understanding of ownership transfers. Cognitive Development, 24, pp. 133−145. Brereton, J.P. (1987). Sacred space. In M. Eliade (Ed. ), The encyclopedia of religion (pp. 526−535). New York: MacMillan. Bulbulia, J. (2006). Nature’s medicine: religiosity as an adaptation for health and cooperation. In P. McNamara (Ed. ), Where God and science meet, vol. 1 (pp. 87–121). Westport: Praeger. Bulbulia, J., Sosis, R., Harris, E., Genet, C., Genet, R., & Wyman, K. (2008). The evolution of religion: studies, theories, and critiques. Santa Margarita, CA: Collins Foundation Press. Darvick, D.B. (2003). This Jewish life. New York: Eakin Press. Douglas, M. (1966). Purity and danger: An analysis of the concepts of pollution and taboo. Boston: Routledge & Kegan Paul. Douglas, M. (1975). Implicit meanings: Essays in anthropology by Mary Douglas. Boston: Routledge & Kegan Paul. Durkheim, E. (1912/1995). The elementary forms of religious life. New York: Free Press. Dzurek, D. (2005). What makes territory important: tangible and intangible dimensions. GeoJournal, 64, pp. 263−274. Eibl-Eibesfeldt, I. & Salter, F., eds. (1998). Indoctrinability , ideology, and warfare: Evolutionary perspectives. New York: Berghahn Books. Eliade, M. (1958/1996). Patterns in comparative religion. Lincoln, NE: University of Nebraska Press. Fearon, J.D. (1995). Rationalist explanations of war. International Organization, 49, pp. 379−414. Firth, R. (1967). Tikopia ritual and belief. Boston: Beacon Press. Friedman, O. & Neary, K. R. (2008). Determining who owns what: Do children infer ownership from first possession? Cognition, 522, pp. 829–849. Gilbert, M. (1996). Jerusalem in the twentieth century. New York: John Wiley & Sons. Ginges, J., Atran, S., Medin, D., & Shikaki, D. (2007). Sacred bounds on rational resolution of violent conflict. Proceedings of the National Academy of Sciences, 104, pp. 7357−7360. Gintis, H. (2007). The evolution of private property. Journal of Economic Behavior and Organization, 64, pp. 1−16. Goddard, S.E. (2006). Uncommon ground: Indivisible territory and the politics of legitimacy. International Organization, 60, pp. 35−68. Goody, J. (1996). A kernel of doubt. The Journal of the Royal Anthropological Institute, 2, pp. 667−681. Gopin, M. (2002). Holy war, holy peace: How religion can bring peace to the Middle East. Oxford: Oxford University Press. Gottlieb, R.S. (2006). A greener faith: Religious environmentalism and our planet’s future. Oxford: Oxford University Press. Hagen, E. & Hammerstein, P. (2009). Did Neanderthals and other early humans sing? Seeking the biological roots of music in the territorial advertisements of primates, lions, hyenas, and wolves. Musicae Scientiae. Hassner, R. (2003). “To halve and to hold”: Conflicts over sacred space and the problem of indivisibility. Security Studies, 12, pp. 1−33. Hassner, R. (2006). Fighting insurgency on sacred ground. The Washington Quarterly, 29, pp. 149−166. Heilman, S. (1995). A walker in Jerusalem. Philadelphia: Jewish Publication Society. Hensel, P.R. & Mitchell, S.M. (2005). Issue indivisibility and territorial claims. GeoJournal, 64, pp. 275−285. Hogan, P. (2003). The mind and its stories: Narrative universals and human emotion. New York: Cambridge University Press. Holm, J. (1994). Sacred place. New York: Pinter Publishers. Huntington, S. (1996). The clash of civilizations and the remaking of world order. New York: Simon and Schuster. Johnson, D.D.P. (2004). Overconfidence and war: The havoc and glory of positive illusions. Cambridge: Harvard University Press. Johnson, D.D.P., Toft, M., & Wrangham, R. (2006). Biology and rationality: The evolution of territorial violence. Annual Meeting of the American Political Science Association, Philadelphia, PA.
Kleinfeld, M. (2005). Destabilizing the identity-territory nexus: Rights-based discourse in Sri Lanka’s new political geography. GeoJournal, 64, pp. 287−295. Korzybski, A. (1931). A Non-Aristotelian system and its necessity for rigour in mathematics and physics. American Association for the Advancement of Science, New Orleans, Louisiana. Kraft, S.E. (2010). The making of a sacred mountain. Meanings of nature and sacredness in Sampi and Northern Norway. Religion, 40, pp. 53−61. Lamm, N. (1985). Faith and doubt: Studies in traditional Jewish thought. New York: Ktav. Lustick, I.S. (1993). Reinventing Jerusalem. Foreign Policy, 93, pp. 41−60. Margolese, F. (2005). Off the derech: How to respond to the challenge. Jerusalem: Devora Publishing. Mayer, T. & Mourad, S.A., eds. (2008). Jerusalem: Idea and reality. New York: Routledge. Mazumdar, S. & Mazumdar, S. (2004). Religion and place attachment: A study of sacred places. Journal of Environmental Psychology, 24, pp. 385–397. McGraw, P., Tetlock, P., & Kristel, O. (2003). The limits of fungibility: relational schemata and the value of things. Journal of Consumer Research, 30, pp. 219−229. Morinis, A., ed. (1992). Sacred journeys: The anthropology of pilgrimage. Westport, CT: Greenwood Press. Near, H. (1992). The kibbutz movement: A history, vol. 1. New York: Oxford University Press. Purzycki, B.G. & Sosis, R. (2009). The religious system as adaptive: Cognitive flexibility, public displays, and acceptance. In Voland, E. and Schiefenhövel, W. (Eds.). The biological evolution of religious mind and behavior (pp. 243−256). New York: Springer Publishers. Rappaport, R.A. (1999). Ritual and religion in the making of humanity. Cambridge: Cambridge University Press. Sagarin, R. & Taylor, T., eds. (2008). Natural security: A Darwinian approach to dangerous world. Berkeley: University of California Press. Sherif, M. (1967). Group conflict and co-operation: Their social psychology. Boston: Routledge & Kegan Paul. Sosis, R. (2005). Does religion promote trust? The role of signaling, reputation, and punishment. Interdisciplinary Journal of Research on Religion, 1, pp. 1−30 (Article 7). Sosis, R. (2007a). The evolutionary logic of sacred land. Religion and Violence Symposium: Evolutionary and Political Perspectives. St. Louis, MO. Sosis, R. (2007b). Psalms for safety: Magico-religious responses to threat of terror. Current Anthropology, 48, pp. 903−911. Sosis, R. (2009). The adaptationist-byproduct debate on the evolution of religion: Five misunderstandings of the adaptationist program. Journal of Cognition and Culture, 9, pp. 315−332. Sosis, R. & Alcorta, C. (2008). Militants and martyrs: Evolutionary perspectives on religion and terrorism. In R. Sagarin and T. Taylor (Eds. ), Natural security: A Darwinian approach to a dangerous world (pp. 105−124). Berkeley: University of California Press. Sosis, R. & Handwerker, W.P. (2011). Psalms and coping with uncertainty: Israeli women’s responses to the 2006 Lebanon War. American Anthropologist, 113, pp. 40−55. Sosis, R. & Ruffle, B. (2003). Religious ritual and cooperation: Testing for a relationship on Israeli religious and secular kibbutzim. Current Anthropology, 44, pp. 713−722. Tetlcock, P.E. (2003). Thinking the unthinkable: Sacred values and taboo cognitions. Trends in Cognitive Science, 7, pp. 320−324. Thayer, B. (2004). Darwin and international relations: On the evolutionary origins of war and ethnic conflict. Louisville: University of Kentucky Press. Toft, M.D. (2003). The geography of ethnic conflict: Identity, interests, and the indivisibility of territory. Princeton: Princeton University Press. Toft, M.D. (2006). Issue indivisibility and time horizons as rationalist explanations for war. Security Studies, 15, pp. 34−69. Walter, B. (2003). Explaining the intractability of territorial conflict. International Studies Review, 5, 137−153. Whitehouse, H. (2004). Modes of religiosity: A cognitive theory of religious transmission. New York: Alta Mira Press. Winston, H. (2005). Unchosen: The hidden lives of Hasidic rebels. Boston: Beacon Press. Eliade, Mircea, (1958/1996), Patterns in Comparative Religion, Lincoln, NE: University of Nebraska Press. Dzurek, Daniel, (2005), “What Makes Territory Important: Tangible and Intangible Dimensions,” GeoJournal 64, pp. 263−274. Toft, Monica D., (2003), The Geography of Ethnic Conflict: Identity, Interests, and the Indivisibility of Territory, Princeton: Princeton University Press. Goddard, Stacie E., (2006), “Uncommon Ground: Indivisible Territory and the Politics of Legitimacy,” International Organization 60, 35−68, p. 37. Fearon, James D., (1995), “Rationalist Explanations of War,” International Organization 49, pp. 379−414. But see Hensel, Paul R. & Mitchell, Sara McLaughlin, (2005), “Issue Indivisibility and Territorial Claims,” GeoJournal 64, pp. 275−285. Hassner, Ron E., (2003), “’To Halve and to Hold’: Conflicts Over Sacred Space and the Problem of Indivisibility,” Security Studies 12, pp. 1−33. Huntington, Samuel, (1996), The Clash of Civilizations and the Remaking of World Order. New York: Simon and Schuster. For general introductions to the cognitive and evolutionary study of religion see Atran, Scott, 2002, In Gods We Trust: The Evolutionary Landscape of Religion, Oxford: Oxford University Press; Boyer, Pascal, 2001, Religion Explained: The Evolutionary Origins of Religious Thought, New York: Basic Books; and Bulbulia, Joseph et al., 2008, The evolution of religion: studies, theories, and critiques, Santa Margarita, CA: Collins Foundation Press. Sosis, Richard, (2007), The evolutionary logic of sacred land. Religion and Violence Symposium: Evolutionary and Political Perspectives, St. Louis, MO. Hensel & Mitchell, 2005; Johnson, Dominic D.P., Toft, Monica, & Wrangham, Richard, (2006), “Biology and Rationality: The Evolution of Territorial Violence”, paper presented at the Annual Meeting of the American Political Science Association, Philadelphia, PA, 2006. McGraw, Peter M., Tetlock, Philip E., & Kristel, Orie, (2003), “The Limits of Fungibility: Relational Schemata and the Value of Things,” Journal of Consumer Research 30, pp. 219−229. Tetlock, Philip E. (2003), “Thinking the Unthinkable: Sacred Values and Taboo Cognitions,” Trends in Cognitive Science 7, pp. 320−324. Atran, Scott, Axelrod, Robert, & Davis, Richard, (2007), “Sacred Barriers to Conflict Resolution,” Science 317, pp. 1039−1040. Ginges, Jeremy, et al., (2007), “Sacred Bounds on Rational Resolution of Violent Conflict,” Proceedings of the National Academy of Sciences 104, pp. 7357−7360. Atran, Scott, (2003), “Genesis of Suicide Terrorism,” Science 299, 1534−1539. Sosis, Richard & Alcorta, Candace. (2008), “Militants and martyrs: Evolutionary perspectives on religion and terrorism” in Raphael D. Sagarin & Terence Taylor (eds. ), Natural security: A Darwinian approach to a dangerous world, Berkeley: University of California Press, pp. 105−124. Eibl-Eibesfeldt, Irenaus, & Salter, Frank K., eds., (1998), Indoctrinability, Ideology, and Warfare: Evolutionary Perspectives, New York: Berghahn Books. Johnson, Dominic D.P., (2004), Overconfidence and War: The Havoc and Glory of Positive Illusions, Cambridge: Harvard University Press; Thayer, Bradley A., (2004), Darwin and International Relations: On the Evolutionary Origins of War and Ethnic Conflict, Louisville: University of Kentucky Press. Sagarin, Raphael D. & Taylor, Terence, eds., (2008), Natural Security: A Darwinian Approach to Dangerous World, Berkeley: University of California Press. But see Johnson et al., 2006, “Biology and Rationality”; and Sosis, 2007a, The evolutionary logic of sacred land. Durkheim, Émile, (1912/1995), The elementary forms of religious life, New York: Free Press, p. 38. Rappaport, Roy A., (1999), Ritual and religion in the making of humanity, Cambridge: Cambridge University Press. See Sosis (2009) for a useful discussion of the challenges and a possible solution to defining religion. Gottlieb, Roger S., (2006), A greener faith: Religious environmentalism and our planet’s future, Oxford: Oxford University Press. Near, Henry, (1992), The kibbutz movement: A history, vol. 1, New York: Oxford University Press. Toft, Monica D., (2003). The geography of ethnic conflict: Identity, interests, and the indivisibility of territory, Princeton: Princeton University Press. Walter, Barbara, (2003), “Explaining the intractability of territorial conflict”, International Studies Review, 5, 137−153, p. 137. Below I will distinguish between sacred space and sacred land; Hassner (2003) does not make this distinction and in an otherwise brilliant analysis unfortunately lumps space and land into one analytical category (see Toft 2006 for similar critique). Hassner, Ron E., (2003), “To halve and to hold: Conflicts over sacred space and the problem of indivisibility”, Security Studies, 12, 1−33, p. 26. See Sosis, Richard, (2007b), “Psalms for safety: Magico-religious responses to threat of terror”, Current Anthropology, 48, pp. 903−911; Sosis, Richard, & Handwerker, W. Penn, (2011), “Psalms and coping with uncertainty: Israeli women’s responses to the 2006 Lebanon War,” American Anthropologist, 113, pp. 40−55; and Sosis, Richard, & Ruffle, Bradley, (2003), “Religious ritual and cooperation: Testing for a relationship on Israeli religious and secular kibbutzim”, Current Anthropology, 44, pp. 713−722. Durkheim, Émile, (1912/1995), pp. 429 & 432. For example, see Berman, Paul, (2010), The flight of the intellectuals, New York: Melville House Publishing, p. 205. Hassner, Ron E., (2003), p. 6. Hassner, Ron E., (2006), “Fighting insurgency on sacred ground”, The Washington Quarterly, 29, pp. 149−166. Darvick, Debra, (2003), This Jewish life, New York: Eakin Press. Lustick, Ian S., (1993), “Reinventing Jerusalem”, Foreign Policy, 93, pp. 41−60. Purzycki, Benjamin G., & Sosis, Richard, (2009), “The religious system as adaptive: Cognitive flexibility, public displays, and acceptance” in Voland, Eckart, & Schiefenhövel, Wulf, eds., The biological evolution of religious mind and behavior, New York: Springer Publishers, pp. 243−256; and Rappaport, Roy, (1999). For example, see Margolese, Faranak, (2005), Off the Derech: How to Respond to the Challenge, Jerusalem: Devora Publishing, and Winston, Hella, (2005), Unchosen: The Hidden Lives of Hasidic Rebels, Boston: Beacon Press, 2005. Goody, Jack, (1996), “A Kernel of Doubt”, The Journal of the Royal Anthropological Institute 2, pp. 667−681. Lamm, Norman, (1985), Faith and Doubt: Studies in Traditional Jewish Thought, New York: Ktav. Bulbulia, Joseph, (2006), “Nature’s Medicine: Religiosity as an Adaptation for Health and Cooperation” in McNamara, Patrick, ed., Where God and Science Meet, vol. 1, Westport: Praeger, pp. 87−121. Gopin, Marc, (2002), Holy War, Holy Peace: How Religion Can Bring Peace to the Middle East, Oxford: Oxford University Press. Alcorta, Candace, & Sosis, Richard, (2005), “Ritual, emotion, and sacred symbols: The evolution of religion as an adaptive complex”, Human Nature, 16, pp. 323−359; Purzycki, Benjamin G., & Sosis, Richard (2009) “The religious system as adaptive”; and Sosis, Richard, (2009), “The adaptationist-byproduct debate on the evolution of religion: Five misunderstandings of the adaptationist program”, Journal of Cognition and Culture, 9, pp. 315−332. Goddard, Stacie E., (2006), “Uncommon Ground: Indivisible Territory and the Politics of Legitimacy,” International Organization 60, pp. 35−68, p. 38. Hassner, Ron E., (2003), p. 11. Toft, Monica D., (2003), pp. 39−40. Brereton, Joel, P. (1987), “Sacred space” in Eliade, Mircea, ed., The Encyclopedia of Religion, New York: MacMillan, p. 527. There can also be multiple sacred lands (Jerusalem, Tzfat, Hebron, Tiberias) within a larger sacred land (Israel). Mazumdar & Mazumdar (2004) offer an interesting typology of sacred place in which they consider sacred cities, structures, burial sites, and places in nature. See Alcorta, Candace, & Sosis, Richard, (2005), “Ritual, emotion, and sacred symbols”, and Sosis, Richard, (2005). “Does religion promote trust? The role of signaling, reputation, and punishment”, Interdisciplinary Journal of Research on Religion, 1, (Article 7), pp. 1−30. Douglas, Mary, (1975), Implicit Meanings: Essays in Anthropology by Mary Douglas, Boston: Routledge & Kegan Paul. Alcorta, Candace, & Sosis, Richard, (2005). Hogan, Patrick C., (2003), The Mind and its Stories: Narrative Universals and Human Emotion, New York: Cambridge University Press. Blake, Peter R., & Harris, Paul L. (2009), “Children’s Understanding of Ownership Transfers,” Cognitive Development 24, pp. 133−145; Friedman, Ori, & Neary, Karen R., (2008), “Determining Who Owns What: Do Children Infer Ownership from First Possession?” Cognition 522, pp. 829–849. Gintis, Herbert, (2007), “The Evolution of Private Property,” Journal of Economic Behavior and Organization 64, pp. 1−16. Sinhalese Buddhists make similar claims. Anagarika Dharmapala offers an important discourse on Buddhist identity and Sri Lanka as an undivided homeland in which he claims “The island belongs to Buddha himself…” (Kleinfeld 2005:288). Hagen, Edward H., & Hammerstein, Peter, (2009), “Did Neanderthals and Other Early Humans Sing? Seeking the Biological Roots of Music in the Territorial Advertisements of Primates, Lions, Hyenas, and Wolves,” Musicae Scientiae, pp. 291−320. Holm, Jean, (1994), Sacred Place, New York: Pinter Publishers; and Morinis, Alan, ed., (1992), Sacred Journeys: The Anthropology of Pilgrimage, Westport, CT: Greenwood Press. Sherif, Muzafer, (1967), Group Conflict and Co-operation: Their Social Psychology, Boston: Routledge & Kegan Paul. Gilbert, Martin, (1996). Jerusalem in the twentieth century, New York: John Wiley & Sons. Douglas, Mary, (1966), Purity and Danger: An Analysis of the Concepts of Pollution and Taboo, Boston: Routledge & Kegan Paul; Durkheim, Émile, (1912/1995), Elementary Forms. For example, see Firth, Raymond, (1967), Tikopia Ritual and Belief, Boston: Beacon Press. Saudi Arabia’s exclusion of non-Muslims from Mecca appears to be an exception. Gilbert, Martin, (1996), Jerusalem in the twentieth century; and Lustick, Ian S., (2008), “Reinventing Jerusalem,” in Mayer, Taylor, & Mourad, Suleiman A., eds., (2008), Jerusalem: Idea and Reality, New York: Routledge. Durkheim, Émile, (1912/1995), pp. 37−38. Heilman, Samuel C., (1995), A Walker in Jerusalem, Philadelphia: Jewish Publication Society, p. 15. Mayer, Taylor, & Mourad, Suleiman A., (2008). Whitehouse, Harvey, (2004), Modes of Religiosity: A Cognitive Theory of Religious Transmission, New York: Alta Mira Press. In a fascinating case study, Kraft (2010) recently explored the social processes that transformed a Norwegian mountain into a sacred site when plans emerged to develop the mountain as an Olympic ski-slope. 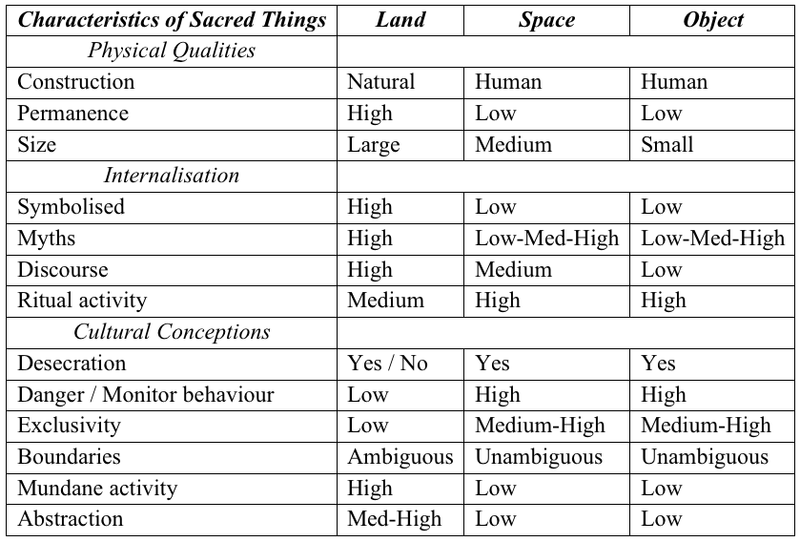 Table 1: Summary of comparison between sacred land, space, and objects.